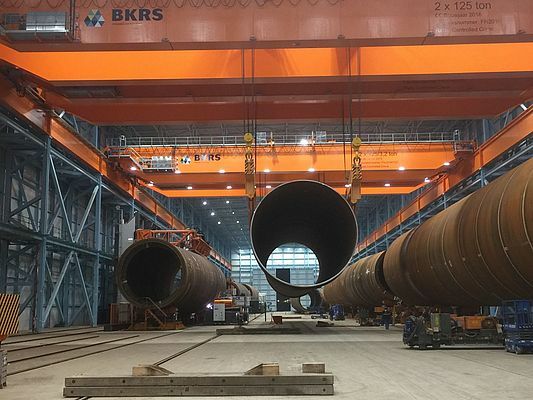 BKRS Crane Systems, the Dutch builder of overhead cranes, has collaborated on a new production facility for the continuous production of seaworthy XXL foundations for offshore platforms. These foundations are manoeuvred in the production hall using specially constructed overhead cranes. Of the six cranes delivered, four can be operated simultaneously in order to lift and move more than 1000 tonnes in a controlled fashion. Precise control of these heavy and extremely long loads was made possible through the application of Yaskawa U1000 frequency drives. 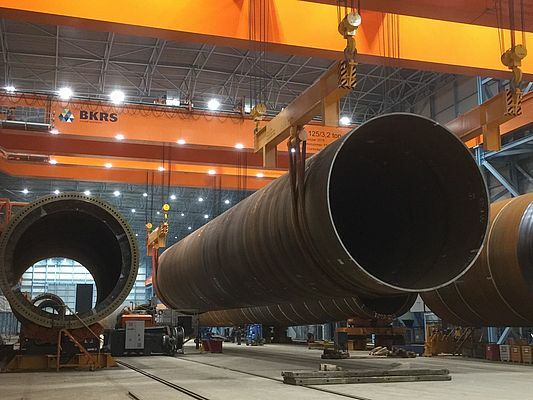 On the grounds of the Dutch Maasvlakte II port in Rotterdam a new production facility has been built for the continuous production of seaworthy XXL foundations for offshore wind turbines and gas and oil platforms. These foundations, with diameters of nine metres or more, are hoisted aboard offshore ships directly from the assembly and coating facility. They are manoeuvred using four special 250 tonne overhead cranes, produced by BKRS Crane Systems in Veghel, the Netherlands. Each crane has two Demag hoisting units, each with a nominal capacity of 125 tonnes. In the hall measuring over 500 m long and 20 m high, the cranes, powered via a power supply rail, are controlled radiographically from the ground. The cranes are powered with 400 V three phase 1200 A (maximum 830 KVe). The four separate 250 tonne cranes can be controlled independently but can also be linked, enabling one man to manoeuvre the extremely long loads of more than 1000 tonnes with precision using four cranes simultaneously. The two remaining cranes have the same construction as the other four cranes but are calibrated for 80 tonnes. Due to the heavy loads the customer requires high levels of quality of the construction of the cranes. The construction meets Execution Class 3 with annual inspection, which means that it has to satisfy the same requirements as, for example, submarines or nuclear installations. For the exact command of these enormous loads during hoisting and transport, high demands are made on the motor control and crane process. BKRS Crane Systems has used Yaskawa frequency drives for many years already. The frequency drives from Yaskawa are perfect for heavy hoist-load control applications. In this project the new Matrix converter U1000 was chosen, characterised by its compact form and the absence of a DC bus. 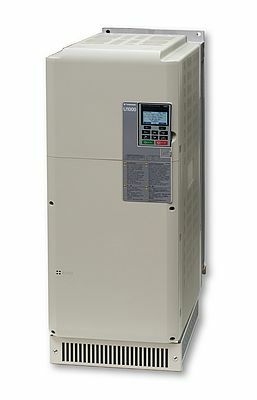 Thanks to the U1000 drives, highly efficient AC-AC direct conversion of the braking power to the mains net is possible. Due to this, the large amount of brake resistance normally necessary in order to process the braking energy is no longer needed. Due to special software installed in the drive, an extremely precise control of the load is possible; during movement and braking the XXL load cannot be allowed to sway or rock, an important requirement from the customer. The Matrix drives are the newest generation of regenerative frequency drives in the extensive range of drives from Yaskawa and fit perfectly into the ‘Green’ crane aspect that limits its CO2 emissions. Beside its compact form it also has a high output and the standard U1000 satisfies the strictest international standards for the Power Factor. There is a global trend regarding the laws relating to harmonics and power factor; the Yaskawa U1000 already complies with IEEE519. In this specific project certain demands were made on the maximum height of the switch-boxes. These were not allowed to be higher than the hoist. Demands were also made on the quality of the switch-boxes; whilst loading the foundations onto ships they are exposed to salt-containing open air. The switch-boxes and frequency drives were provided with high-grade lacquer and double seals for this reason. BKRS Crane Systems made detailed designs of the switch-boxes and engineered and built them themselves. Furthermore, braking resistance was to be avoided. Due to the compact dimensions and minimal internal heat generation of the U1000 frequency drives, creative engineering and specially built cabinets BKRS Crane Systems could easily meet all the requirements.